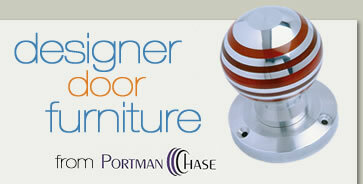 If you're looking for something that makes a property stand out from the rest, talk to Portman-Chase .... we open the very best doors. Never has so much attention to detail been lavished on door mechanisms . . . from material composition and blending through to the silky smoothness of the rotational action. Using only the finest materials, both precious and non-precious, our designers have crafted a range of doorknobs to meet the needs of the worlds most discerning people. Architects and Designers serving both the private and commercial sectors rely on the quality and style of Portman Chase products to complement their very best work. In addition to exemplary design Portman-Chase products make use of a unique operating mechanism designed to deliver unrivalled feel as well as trouble- free operation. Beautifully engineered in solid materials, these contemporary pieces are available in a range to compliment the most elegant decor and surroundings.